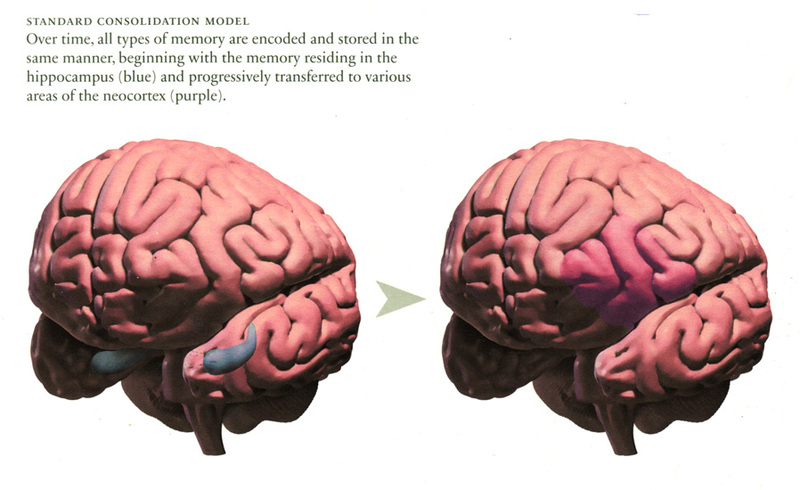 An illustration demonstrating where memories are encoded and stored in the standard consolidation model of memory. Working for the University of Toronto's arts and science review 'idea&s', I created illustrations to help explain Morris Moscovitch's model of memory consolidation. The illustrations showed the brain regions thought to be involved at different stages of memory. To appease the client, the illustration was created with an emphasis on style rather than being didactic. Moscovitch, M. 2007. The neuroanatomy of re-experiencing a memory. idea&s vol. 4:1. 47-49.